An inspirational workbook for beginners and professionals. A richly illustrated new edition takes the reader on a voyage of discovery into the versatile world of papier-mâché (also paper-mâché, paper mache) and proves that it is possible to make more of it than just piggybanks and colourful Nana reproductions. 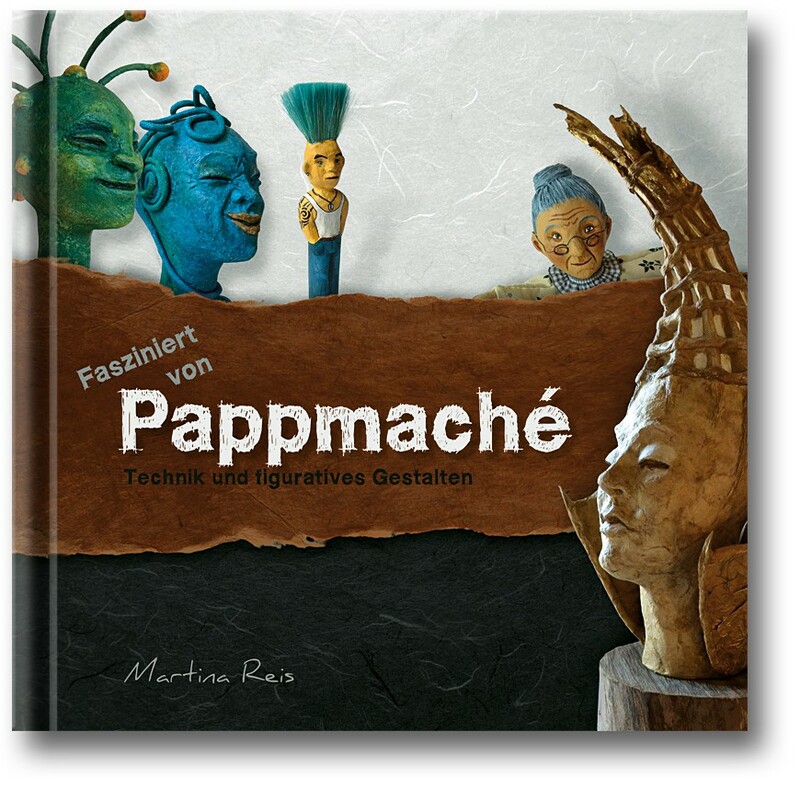 The book explains the basics of the papier-mâché technique in an entertaining and comprehensible way; you can try the technique out based on many practical examples (primarily figurative motifs). 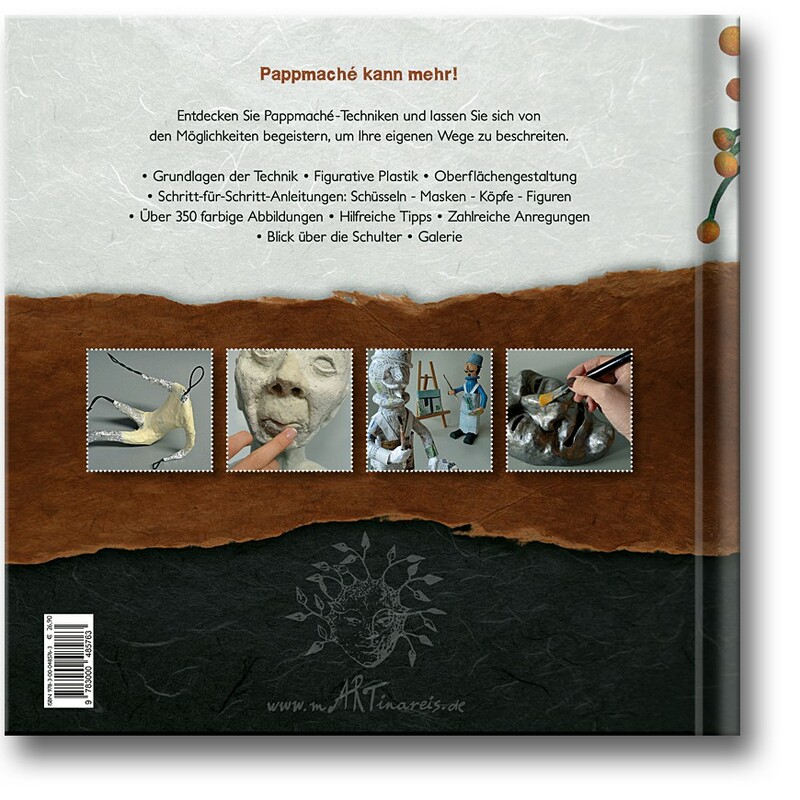 The THEORETICAL PART explains different papier-mâché techniques. There is also a systematic overview of tools, materials, and creative options for final touches. Explanations of the basics of figurative shaping, such as proportions and construction design, are given here. The PRACTICAL PART – PROJECTS – contains easy-to-follow step-by-step instructions. At first, will we form bowls in different ways in order to become familiar with the papier-mâché material. Bowls are followed by masks, figures, and heads in many executions and at many levels of difficulty. A doll head made of papier-mâché will also be picked and presented in detail. Numerous illustrations and detailed descriptions make the work with papier-mâché comprehensible. The described objects are very different as far as their formation and surface finish are concerned, so that you got as many ideas as possible, both in the technical and decorative respects. You can look over my shoulder while I work in a separate subsequent part entitled MAKING OF. The last part of the book – the GALLERY – presents a selection of my works. Shipping costs (Germany: € 2.00, Europe: € 7.00).